I love all kinds of slaw, particularly this flavorful one! 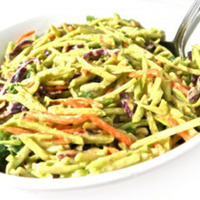 Using broccoli slaw is a wonderful alternative to typical cabbage. Such a versatile side dish for fish, beef, chicken, pork, hot dogs, burgers and more. You’ll love how quick it is to make. The skinny for each serving just 38 calories, 1 gram of fat and 1 Weight Watchers POINTS PLUS. To make the coleslaw dressing-In a small bowl, mix together mayonnaise, yogurt, mustard, vinegar and honey. Refrigerate until ready to serve. Just before serving, add broccoli slaw and scallions to a bowl. Toss with dressing. Leftovers can be refrigerated and served the next day. It still tastes great. Cook Eat Share Nutrition Facts are NOT correct!!! Skinny and Delicious Chicken and Eggplant Pasta for 326 Calories!